On the evening of Friday, January 13, 2012, there were scenes of panic near the island of Giglio, Italy—the Costa Concordia, a luxury cruise ship, hit a sandbar causing a 165 feet gash across the ships left side. The ship started taking on water forcing some 4,200 people aboard to evacuate. Most people managed to reach the nearby island by lifeboats, others swam ashore, and some 50 people who were trapped on the badly listed ship were plucked to safety by helicopters. Unfortunately, this accident claimed the lives of at least 16 people—21 more people remain listed as missing. In addition, experts fear fuel could leak from the capsized cruise liner into the sea off the Italian coast. 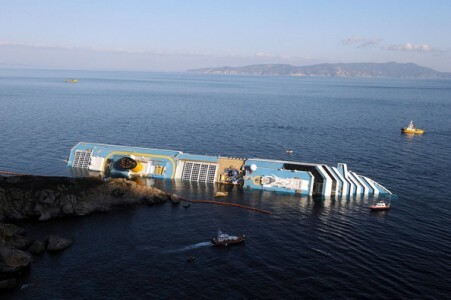 After an unidentified liquid was found escaping from the holed cruise liner, Italy’s government declared a state of emergency. The man accused of causing this disaster by steering the ship too close to the island’s shore and later abandoning the ship before evacuation was completed, Francesco Schettino, the captain of the ship, is under house arrest. Costa Cruises, a daughter of the US Carnival Cruises, offered today in addition to a refund of the full costs of their cruise, travel expenses and any medical expenses sustained after the grounding a €11,000 (~$14,500) settlement to each passenger, whether child or adult, who suffered no physical injuries—injured passengers will be dealt with individually. However, Codacons, an associations for the protection of the environment and the rights of users and consumers, did not participate in the negotiations, and is collecting names for a class action suit to be filed in Miami, Florida requesting €125,000 (~165,000) for each passenger. Codacons’ president Carlo Rienzi even urges passengers to see a doctor to check whether they had suffered psychological trauma. American advocates however argue that each passenger has different damages and needs to be dealt with individually. Therefore, they do not see a class action to be the right tool and instead suggest for passengers to file individual lawsuits. On Friday, January 6, 2012 after a months long investigation by the New Hanover County Sheriff’s Office (hereinafter NHSO), Vice and Narcotics Detectives seized the largest amount of heroin in NHSO history, and arrested Tierre Henderson. The raid lead to the discovery of 300 small paper bags of heroin stamped “Breaking Dawn” and “Dream Catcher” which have a street value of more than $9,000, and diverse drug paraphernalia. The accused drug trafficker Tierre Henderson is now held in New Hanover County Detention Facility for four counts of possession with the intent to manufacture, sell, or deliver heroin, two counts of sale or delivery of heroin, two counts of conspiracy to trafficking in opium/heroin, four counts of maintaining a dwelling, vehicle, or other place for the use, storage, or sale of a controlled substance, manufacture of heroin, four counts of trafficking in opium/heroin, and five counts of possession of drug paraphernalia. He is held under a $2.5 million bond. His next court appearance is schedule in New Hanover County District Court in Wilmington, North Carolina on January 19, 2012. 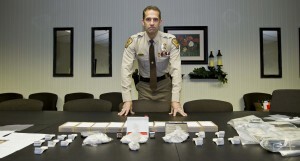 The investigation of Tierre Henderson also lead the Vice and Narcotics Detectives to Chrissy Joy Sinclair in her residence in Holly Ridge, where—with the assistance of the Holly Ridge Police Department—5.5 ounces of pure uncut heroin was seized which would produce over 15,000 bags of heroin on the streets of New Hanover County, along with drug paraphernalia, and $60,000 cash. Chrissy Joy Sinclair is being held in the New Hanover County Detention Facility under a $1 million bond. She is charged with five counts of conspiracy to trafficking in opium/heroin, two counts of maintaining a dwelling, vehicle, or other place for the use, storage, or sale of a controlled substance, and possession of drug paraphernalia. Her next court appearance is schedule in New Hanover County District Court in Wilmington, North Carolina on January 26, 2012.